The precepts of Tolerance and Liberty are constituent parts in the conception of American Freedom - Where intolerance grows (e.g., racial supremacy or religious coercion/compulsion), Tolerance fades and liberty-for-all withers when silent. XXXIX. And...no minister of the gospel, or priest of any denomination whatsoever, shall, at any time hereafter, under any presence or description whatever, be eligible to, or capable of holding, any civil or military office or place within this State." The United States of America came together as a secular nation with the pledge that "Congress shall make no law respecting an establishment of religion, or prohibiting the free exercise thereof." Yet, Governors Island's legacy of the year 1624 and New York State's birthright became only available to all U.S. citizens in 1868 upon a Bill of Rights amendment which displaced individual state rights in religious matters and rendered the 1791 First Amendment effective thus. Therefore, as of that year, 1868, citizens of the secular United States were also afforded freedom from religion and religious submission or compulsion. Namely, religious commandments and strictures became subordinate to the primacy of secular law which now set the limits of citizens' liberties. Composing a triad of America's fundamental values as National Symbols in New York Harbor—Tolerance, Liberty and Welcome as embodied by Governors Island, Liberty Island and Ellis Island—by recognizing each island’s unique facet of history: the “National Heritage Triangle” as an allegory of harmonious virtues. The magnitude of the emblematic value of Governors Island as the nation’s oldest natural historic symbol is based on one’s deeper understanding of three critical historical events: the three primary European landings and settlements on the North American East coast which led to the formation of the Original Thirteen. They were: Jamestown, Virginia, 1607; New Plymouth, New England, 1620; and Nooten Eyland, New Netherland, 1624 (now Governors Island, New York). In the discussions of "What to do with Governors Island? ", all pertinent officials and nearly all legislators have denied—through silence from 1997 through 2009—the island's 1624 historic legacy which shaped and became part of our national identity (similar to express historical unconsciousness of the Holocaust but having distinct opposite effects, i. e., a new beginning with spiritual rebirth through freedom of conscience in religion versus deportation into an abyss pending death through ethnic/religious hatred.) Yet, the Governors Island landing/settlement was the best planned, the most successful one and by far the most important one of the three because it was on the place on which the New World's first juridical expression of religious tolerance took place. As the locus of the political-cultural conception of freedom of conscience in religion—the basis of pluralism and individual freedom (= liberty) in North America—Governors Island signifies the origin of religious freedom through the jurisprudence of toleration (= religious tolerance). That Tolerance, as America’s ultimate value and dynamic precept, precedes Liberty. It is vital in defining and defending the often generic or static notion of [personal] American freedom. Tolerance and Liberty can both be recognized visually as equal or conjoined partners in the conception of American Freedom. We envisage doing that on the officially recognized 1624 birthplace of New York State because that place—Governors Island—connotes the womb of New York State’s historic legacy and cultural identity of diversity through Tolerance—New York's gift to the nation. (For historical quotes of the official instructions to the Jamestown and Governors Island settlers go to page three of the ARTICLE below: “Governors Island, Lifeblood of American Liberty.)" • Is the UNITED STATES interested in protecting and preserving its national heritage of historic substance and of profound thematic meaning to AMERICAN freedom? Will it embrace and endorse the Governors Island Preservation and Education Project aimed at perpetuating the memory of a place and a history that is of the utmost importance to humanity, that may help extinguish the fires of intolerance and be remembered as a symbol of hope to the country, if not the world? Is it ready to accept the Tolerance Monument as the universal embodiment of the dynamic force of tolerance? • Can NEW YORK STATE, or the New York Tri-State region, provide leadership in safeguarding its seventeenth-century geo-political legacy of toleration as precursor to its 1777 Constitution and the 1791 First Amendment in the Bill of Rights—culturally enduring but temporarily lost for a century by an English Act of Parliament that outlawed the Roman Catholic faith in 1691—by actively reinstating the nation's oldest natural, historic and cultural monument and turning it into an asset of 21st-century relevance? • Will NEW YORK CITY be generous enough to integrate the State's most important landmark and yet unexploited national cultural asset—Governors Island—into contemporary community life, and so achieve a greater shared knowledge about the nation's past, strengthen the Tri-State's identity of tolerance as the lifeblood of American liberty, fortify New York's civic pride, and drive New York's artistic and economic vitality (sign PETITION)? New York’s legal and political tradition of tolerance, the basis for its characteristic cultural diversity and pluralism, had its beginnings on Governors Island. That tolerance is central to the contemporary American conception of freedom which can be defined in terms of the twin credos of tolerance and liberty. Its origin as an ethical force in the Western Hemisphere and as a legal and political imperative can be traced to the year 1624, in what is now the State of New York. (For third-party video CLICK on YouTube). Tolerance is an active dynamic entailing reciprocity and reciprocal respect. Always bilaterally demanding, it forges “American” freedom by relentlessly transforming plurality into constructive pluralism as a never-finished product of American culture. Tolerance defines and gives meaning to an otherwise undemanding “generic” or “static” freedom. It is the indispensable dynamic component in American freedom and Western civilization. Without conscious vigilance and broad awareness of that vital, fundamental notion of tolerance, there will be times when there will be no freedom in the sense that Americans recognize that term today. Left unnurtured and unprotected, simple liberty invites and facilitates the "friends" of intolerance and extremism—complacency, carelessness, apathy, passivity and insipidness—foretelling looming disaster or opening the door to insidious assaults on civil liberties with voices in the name of disingenious slogans like "freedom" or rhetoric like "American values." A proposed Governors Island Tolerance Park will halt historical amnesia and restore Governors Island to its rightful historical importance by preserving its historic message of universal value that lies at the root of American liberty. Thus, the park will provide our children with an opportunity to understand the meaning of American freedom. It will afford them a deeper appreciation of tolerance and liberty as equal partners in a pluralist society, at the very place where these notions first took root in 1624. Tolerance builds liberty. Intolerance kills liberty. The Park will therefore preserve Governors Island's historic symbolism, be an enduring beacon for humanity and extol America's vital role in advancing liberty through the moral force of tolerance. Diversity fosters tolerance as a pragmatic result out of necessity (in trade-based urban centers for instance.) However, broad awareness of the precept of Tolerance as precursor to liberty-for-all and as a reciprocal dynamic in the notion of American Freedom would expose the iniquities of intolerance. It would help to coexist peacefully by furthering successful pluralism/diversity across the land. Tolerance is the complement of intolerance. Tolerance therefore can't be sloth or indifference as neither is intolerance. Tolerance must be pro-active in the defense of American liberty. Only through conscious vigilance will it drive out intolerance - the forces of inequality, bigotry and discrimination - which insidiously attacks liberty and undermines the norms and values of the United States as a secular, liberalist democracy. As a universal value from which Liberty sprouts, the principle of Tolerance extends the boundaries of Liberty for all mankind through eternal consciousness and vigilance through an ICONIC STRUCTURE. The ideal notion of Tolerance being selective (i.e., excluding any one group and thus not pertaining to all groups), therefore, is incongruous. The Tolerance precept - a two-way street - is America's ultimate virtue. It bears no relation to the verb 'to tolerate' - a one-way street. Intolerance divides - Tolerance unites! Furthermore, certain religions, ethnicities and races have not adjusted yet to the welcome they received from America or are unwilling to know and understand America's ethos as rooted in its liberalist democratic culture. Newly imported faiths from monistic cultures where state and religion are one and the same or which don't always consider and allow the validity, freedom and equality of other ethnicities or religions (e.g., by executing converts) or don't always accept people of differing consciences (infidels), teach their adherents the gospel of intolerance. They would have to accept the notion, and adjust accordingly that when in the U.S., under the U.S. Constitution, supremacy of a religion or race is forbidden since 1868 and 1865 respectively. The secular state thus protects the rights of its citizens - including minors/innocents - which must be upheld by civil authorities and cannot be delegated to religious authorities. Unless religious organizations and their devotees understand that religious identity is not identical to religious spirituality and are taught, officially, to live according to the dynamic principle of tolerance as the foundation of American liberty - i.e., by demanding change in some of their religion's rules, traditions or antediluvian practices and behavior (e.g., polygamy, ritual female circumcision of minors and honor killings, or denying employees of faiths-based, state-subsidized institutions direct access to federally-mandated contraception services) - their insular, intolerant or ignorant conduct may become a severe problem in America in the future: Some groups may fail to coexist successfully or peacefully according to America's democratic values (e.g., by rejecting equality/liberty of the sexes or races) or, alternatively, these fundamental American values may become obscured or cease to exist altogether by condoning intolerance and by political complacency or appeasement. In his Chapel Hill Commencement Address of May 13, 2012, New York City Mayor Michael Bloomberg proclaimed that "If government can deny freedom to one, it can deny freedom to all...More than any other generation that has walked the earth, you are free to pursue your dreams - unbounded by limits placed on your race, gender, ethnicity, orientation or lineage...Exclusion and equality are mortal enemies - and in America, every time they have met in battle, equality has ultimately triumphed...I have no doubt that in your lifetime, liberty's light will allow us to see more clearly the truth of our nation's founding principles, and allow us to see all people, and all couples, as full and equal members of the American family." In his Inaugural Address of January 1, 2011, Governor Andrew M. Cuomo said that "Only the people's voice can silence the calls of the special interests in the halls of the Capitol...In truth the partnership between the Executive and the Legislature has not been working well for years and that must change...The potential [real] power of the Governor is to mobilize the people of the State of New York." In his State of the State Address of January 5, 2011, he proclaimed: "We currently have a government of dysfunction, gridlock and corruption - we have to transform it into a government of performance, integrity and pride...The New York State Legislature is the best legislature historically in the nation, the most talented people, that's, that's who we are...We want a government that puts the people first and not the special interests first." On June 6, 2009, President Barack H. Obama said: "As we face down the hardships and struggles of our time and arrive at that hour for which we were born, we cannot help but draw strength from those moments in history when the best among us were somehow able to swallow their fears and secure a beachhead on an unforgiving shore." In his Inaugural Address of March 17, 2008, Governor David A. Paterson proclaimed: "Let us put personal politics, party advantage and power struggles aside, in favor of service, in the interests of the people...Let me introduce myself...I am the governor of New York State." Governors Island, Nooten Eyland (in pidgin language Nutten Island) until 1784, is the place of origin of American tolerance as the basis for cultural diversity and pluralism and, as such, it embodies a Message of Profound National Importance. Therefore, the island’s cultural and national heritage has outstanding universal value which could qualify it as a potential World Heritage Site. Together with liberty, the notion of tolerance serves to define the cultural and juridical construct to which American personal freedom refers. In the face of intolerance, tolerance is a vigilant dynamic — it is neither uncritical acceptance, complacency, appeasement or submission, nor laxity, sloth or indifference. 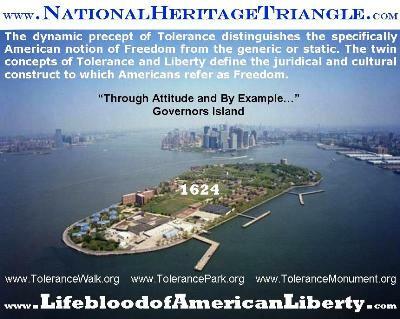 Embedded in Governors Island—New York State’s legally recognized, historic birthplace—tolerance is the quintessence of New York’s cultural patrimony since 1624 (CLICK HERE for Legislative Resolutions 5476 and 2708 which recognize this heritage). With the arrival of the first settlers to the New York Tri-State region on Governors Island in 1624, the legal and cultural traditions of the Low Lands, including the basic human virtue and jurisprudence of toleration (= religious tolerance) as the basis for ethnic diversity, were first implanted by law upon North American soil (unlike the first landings in New England and Virginia). This plurality, for instance, was recorded in a census of 1639 and portrayed on a Manhattan map which shows a large farm owned by America’s first Muslim planter, Antoni du Turck, a Moroccan from Fez. After sixty years as New Netherland (1614-1674), the region – now the New York Tri-State area – came under definitive English authority. The virtuous conception of tolerance, thus introduced in the Western Hemisphere and rooted in New York State’s very birth in the year 1624, can be considered New York’s first and unique contribution to American culture. Governors Island is therefore the nation's oldest natural symbol of primary value. Its message is America's ultimate virtue. One hundred fifty two years later, in 1776, New York’s birthfather’s fundamental precept of political freedom (and with regard to individual freedoms, in 1791, by way of the First Amendment) was to become the crucial underpinning of the American Republic with the adoption of the "Right-of-Man-Doctrine" that formed the basis for the statement that "The United Colonies are, and of Right ought to be Free and Independent States." That doctrine stated, in 1776, that "whenever any form of government (the English Crown) becomes destructive of these ends, it is the right of the people to alter or to abolish it and to institute new government." One hundred ninety five years prior to that Declaration of Independence, in 1581, the same doctrine was the basis for the United States of the Netherlands when it stated that "when a ruler of the people (King Philip II of Spain) does not behave thus, but on the contrary oppresses them...they may not only disallow his authority, but legally proceed to the choice of another ruler for their defense." It was therefore no happenstance that John Adams wrote, in 1781, that "the originals of the two republics are so much alike that the history of one seems but a transcript from that of the other...the great characters the Dutch Republic exhibits...have been particularly studied, admired and imitated in EVERY American state." Later Adams wrote: "I modestly blush for my nation when I consider the low estimation in which we have held the importance of the [Netherlands] connections with us. Their separation from England, union with France and Spain and their treaty with us was THE EVENT which ultimately turned the scale of the American Revolutionary war and produced the peace in 1783." The analogous republics—the United States of America and the United States of the Netherlands—were not coincidental. The latter’s DNA and precepts, implanted on Governors Island in the year 1624 and the building block of America’s earliest childhood, were responsible for the traits that shaped America's like-minded personality and deeply felt commitment to political freedom and individual liberty. The right to rebel against tyranny, the right to seek redress of grievances and freedom in religion and of the press, all can be traced to the New York Tri-State region when it was known as New Netherland with New Amsterdam (now New York City) at its center. In summary, Governors Island—as the place of first settlement between 38 and 42 degrees latitude, sandwiched between Virginia and New England, and as the legally recognized birthplace of New York State on which the jurisprudence of toleration (= religious tolerance) as a precept in the conception of American freedom was planted in 1624—is a historical archeological landmark of 21st-century thematic relevance and enduring value to future generations. For the above mentioned reasons, the island is a natural historic National Symbol while representing the uniquely-shared Mutual Heritage of two nations. Only by knowing and understanding the juridical implications of what happened on Governors Island in 1624 can the original and enduring cultural contribution of the first (now New York) settlers to American culture be grasped. It requires knowing and understanding the original form of government of New Netherland (later the New York Tri-State region) – so named from 1614 through 1674 – with its split existence of a North American province of the Dutch Republic starting in the year 1624 from theretofore having been only a place for private commercial interests through patents issued by the States General – the Dutch Parliament – since 1614. Namely, codification of common law in both the States of Holland and of Zeeland took place from 1580 through 1624. Because the [Dutch] West Indian Company (WIC) was given, in 1621, a dual legal position as trading institute and as sovereign under the authority of the States General, New Netherland’s colonists had to swear allegiance to both the WIC and the States General. Those Holland and Zeeland ordinances, together with civil, maritime and commercial laws were placed as legal code onto the New Netherland province by the Governors Island settlers directly and through incorporation by reference pursuant to the March 1624, January 1625 and April 1625 instructions to the settlers. These instructions contained the legal-cultural code that lies at the root of the New York Tri-State traditions and, ultimately, American pluralism (diversity) and liberty through the active notion of tolerance as the basis for ethnic diversity and [American] freedom. It were those first settlers to Governors Island in 1624 who planted the concept of toleration (= religious tolerance) as a legal right for North Americans as per explicit orders that they had been given on their departure from Europe. They had to attract, “through attitude and by example”, the natives and non-believers to God’s word “without, on the other hand, to persecute someone by reason of his religion and to leave everyone the freedom of his conscience” (via “levenshouding en voorbeeld” moesten zij “de Indianen ende andere blinde menschen tot de kennisz Godes ende synes woort sien te trecken, sonder nochtans ijemant ter oorsaecke van syne religie te vervolgen, maer een yder de vrijch[eyt] van sijn consciencie te laten”). Those instructions derived from the founding document of the Dutch Republic, the 1579 Union of Utrecht, stating “that everyone shall remain free in religion and that no one may be persecuted or investigated because of religion” (“dat een yder particulier in sijn religie vrij sal moegen blijven ende dat men nyemant ter cause van de religie sal moegen achterhaelen ofte ondersoucken”). That statement, unique in the world at the time, became the historic underpinning for the opening of the first synagogue in the Western Hemisphere at Recife in Dutch Brazil in 1642 and the 1654 arrival of WIC sponsored Ashkenazic Jews at New Amsterdam in New Netherland followed by the granting of official residency of Sephardic Jews at New Amsterdam in January 1655 who had arrived as unauthorized destitute refugees in September 1654. The 1624 settlement completed the claim on the territory transforming it to a North American Province according to the Law of Nations: (1) Discovery in 1609 (2) Surveying and Charting from 1611-1614 and (3) taking Possession through Settlement. 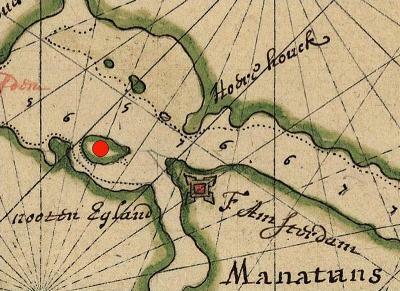 Some of the Governors Island settlers were geographically dispersed to the Delaware River, the Connecticut River and at the top of the Hudson River (now Albany) in order to juridically delineate the claim to the “Province of New Netherland” (now the New York Tri-State region). 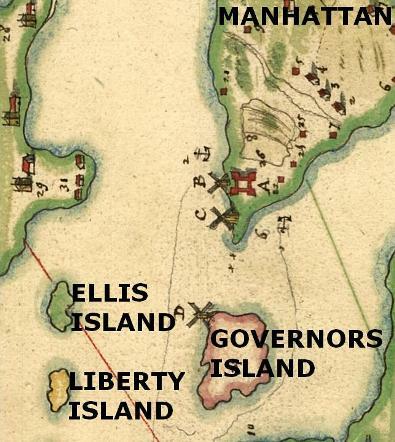 Of the three primary European landings/permanent settlements on the North-American East coast—Jamestown in Virginia, 1607; New Plymouth in New England, 1620; and Noten Eylant in New Netherland, 1624 (i.e., now Governors Island in the New York Tri-State)—the Governors Island settlement was the best-planned, the most successful and by far the most important one with regard to its contemporary relevance and significance for the future of our nation. Namely, the Governors Island landing introduced the jurisprudence of freedom of conscience and religious tolerance as the basis of pluralism and liberty in North America. That latter notion is to be illustrated, again, on New York State’s very birthplace—Governors Island—in the form of a Tolerance Park project which is reflective of New York’s historic cultural identity. 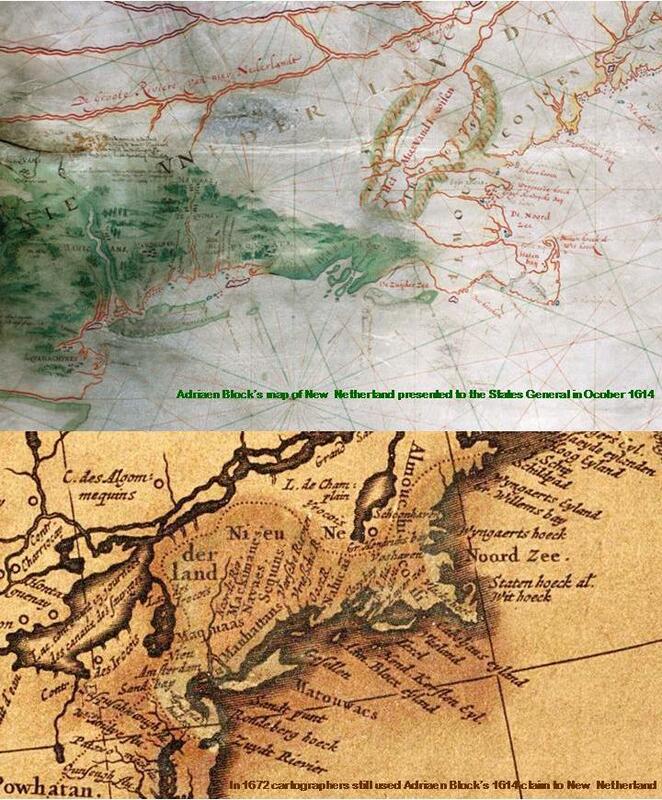 EXPLORER ADRIAEN BLOCK AND HIS CAPTAIN HENDRICK CHRISTIAENSZ WERE THE FIRST PERSONS EVER TO SURVEY AND CHART THE COAST LINE BETWEEN THE 38th AND 45th PARALLELS AND NAMED THE TERRITORY NEW NETHERLAND IN 1614. THIS MAP IS THE RESULT OF FOUR VOYAGES STARTED IN 1611. The first recorded resident of Governors Island was Jan Rodrigues from Santo Domingo, a Latin-American of African and European ancestry who was the first person to summer on the island in 1613. He was employed by the private Amsterdam fur trader and explorer Adriaen Block who had hired him in the [New York] harbor in May that year and had left him behind on the island to serve as his on-the-spot factor to trade with the natives. Block was to rendezvous again with Rodrigues in December 1613. Rodrigues was a free man and served as Block’s interpreter in trade negotiations with the Hudson River Indians. Governors Island, therefore, carries a meaning of historic as well as cultural importance to the descendants of three continents: American Indians, Africans and Europeans. Because the island was the original center for European trade with the Hudson Valley natives and the region’s historical crossroad of three cultures, a vital component of the 50-acre museum-park-to-tolerance will be a Tolerance Hall to include a museum of human servitude with special emphasis on the Atlantic arena in the 15th through 17th centuries. The relevance of such a museum may best be underscored by the fact that, today, there are more chattel slaves in the world than ever before: between 12 to 27 million. This is in spite of the United Nations' 1948 Universal Declaration of Human Rights, in Article 4, that "No one shall be held in slavery or servitude; slavery and the slave trade shall be prohibited in all their forms." This Tolerance Hall is envisaged to be encased by the Tolerance Monument as the park's centerpiece: a 151 ft (46 meters) high iconic emblem as symbol of hope. Because the Tolerance Monument's image is based on a sculpture which was dedicated by its creator, Barnett Newman, to the memory of the Rev. Dr. Martin Luther King Jr. in 1968, this envisaged monument is implicitly a tribute to racial tolerance—recognizing the fact that, for the African-American segment of the population, liberty was a concept from which they were largely [legally and culturally] excluded thus making the meaning of [the Statue of] Liberty suboptimal. Specifically, in a culturally intolerant society, the notion of [constitutional] freedom is of little consequence unless actively defended [politically] through "conscious vigilance." Tolerance, therefore, precedes Liberty in the conception of American Freedom. As fraternal twins they are complementary and mutually dependent. Tolerance is an active attitude prompted by recognizing the fundamental freedom of others. It is harmony in difference—an indispensable realization in a pluralistic society. The inherent significance of tolerance to freedom-for-all was only legally attained with the Civil Rights Act of 1964 and the Voting Rights Act of 1965. Successful pluralism in a free society requires broad awareness and conscious vigilance in order to help protect and foster the notion of American freedom. • transform Governors Island into an enduring national symbol by passing a non-partisan bill that would grant legislative approval for a project of momentous national educational importance and containing a potent message of 21st-century relevance for the common good and in the national interest. As America's prime symbol, the island embodies the historic bedrock from which the island symbols of Liberty and Welcome in New York Harbor germinated. Continued political inertia and legislative silence will ensure the conscious obliteration of the Tri-State’s colossal seventeenth-century legacy. Because of stealth legislative disinterest, political lethargy and passivity, New York State's unique repository of knowledge about its distinctive, important early history with an enduring message of substance and relevance risks to remain lost forever to America's citizens. The probable eradication through furtive indifference of New York State's most significant relic - the Western Hemisphere's only original, historic vestage of the building block of Tolerance that lies at the core of American Freedom - echoes, if less dramatically, the cultural violation perpetrated by the Afghan Taliban in March 2001 when it destroyed the world's two ancient, colossal Bamiyan Buddhist relics. The ruination of New York State's heritage and Governors Island's legacy through a [financially impossible] tendentious generic park of recycled materials as currently promulgated by a State agency would be no different from closing one's eyes to the demolition of Jamestown Settlement for the benefit of a highway project or a Congressional decision to eliminate the day of Thanksgiving as a national holiday. For discussion details CLICK HERE. Governors Island's Legacy, New York's Identity, Lifeblood-of-American-Liberty. Following intense and extensive exchanges by the Tolerance Park Foundation at the federal government level under two White House administrations, at least fifty acres for the Education and History Project had been set aside by the federal government as a condition for nominal transfer of jurisdiction to New York State on February 1, 2003 (see Discussion Details “Moral Conscience” on bottom left). Tacit understanding and the expectation that the New York State and City Legislatures would move to dedicate the reserved acreage to New York’s cultural patrimony (30% of the 172-acre large island) has not come to fruition as yet. However, political acceptance of America’s ultimate virtue of tolerance through legislative action is vital for the creation of the financially self-sustaining, nonprofit (yet profitable) project because State/City agencies and special and commercial (=for optimal profit only) interests might not respect the ethos of Tolerance, Liberty and Welcome that the National Heritage Triangle so clearly symbolizes. What interests have prevented New York State Senate and Assembly members from practicing the civilities of democracy or exercising their altruistic duty, from 1998 through 2009, to restore, preserve and sustain (1) Governors Island’s momentous legacy, (2) New York State’s birthplace, birthright and historical identity, and (3) a fundamental precept in the conception of American Freedom? What special powers have ingratiated themselves with what legislators to deserve their attention or to receive their allegiance at the expense of broad legislative recognition of and support for New York State’s most historic landmark and emblematic symbol? What has been the seminal lubricant that has corroded the State’s democracy and a robust democratic process thus silencing the Legislature into inaction regarding a vision of depth and breadth for tomorrow? Will ethical choice as yet be the guiding force for a legislative decision, after the year 2009, with respect to the efficacy and conceptual merits of the self-sustaining Tolerance Park with its centerpiece "Broken-Obelisk" (CLICK HERE) as Tolerance Monument (click GovernorsIslandToleranceMonument.com)? Or will legislative silence continue to represent conscious damnation of national memory thus favoring short-term appeasement of special and narrow constituencies for the protection of partisan power, the pursuit of self-interest and political gain?